For many established and traditional businesses in both the B2C and B2B space, it has been tempting to see the digital medium as a way of cutting back on print marketing budgets. The perception that digital marketing is a cheaper option, that can deliver a more trackable or predictable ROI, is a false one. Modern businesses ignore the digital medium at their peril of course, limiting their exposure to new consumers and even denting their reputation in the eyes of an increasingly online-dependent consumer base. But, whilst digital marketing is crucial in this connected age, abandoning or scaling back print marketing budgets could prove counterproductive in the long term. What’s needed is a synthesis of approaches. After all, if there’s one thing that the digital revolution has taught us, it’s that the secret to success is often found by connecting the dots between different marketing platforms. It’s clear from recent studies that print is far from dead and that customers in both the B2B and B2C spaces still place a lot of trust in printed marketing material, like direct mail or magazine advertising. This can be seen both in terms of building brand awareness and influencing purchasing decisions. The trick to fusing these tried and tested methods with an established digital strategy is to identify and then leverage the individual advantages each has to offer. One example of this is the way digital can produce real time metrics through tools like Google Analytics. To use this data across both print and digital campaigns, you will need to track the crossover between media and this isn’t always easy. Ad platforms like AdWords and AdBrite will produce ‘view-through’ conversion tracking, but this even has its limitations tracking digital footprints, let alone offline ones. Tracking the customer through the sales funnel across both print and digital, from awareness through to purchase and beyond, involves utilising as many techniques and tools in your armoury as possible. It also means constantly seeking feedback both online and off. Surveys, polls and questionnaires on websites, social media and through print campaigns can capture some of this data for you. But it’s not enough just to capture user data if you can’t work towards creating a joined up marketing strategy in the first place. To do this you need to start thinking about cross pollination. Personalised URLs, QR codes and NFC tech can not only help you track the success rates of printed campaigns but they can form effective bridges from print to digital, often via a smartphone or tablet. The versatility of QR codes in particular allows you to use them on any printed material, from billboard posters to magazine ads. The potential for creativity and personalised branding in this area is huge. Social media works perfectly with print but this is a two-way street as well, so always look to your social media accounts to really promote and build buzz around your new print advertising campaigns. Conversely your printed materials, from ads to business cards, should all contain your social media URLs as standard. 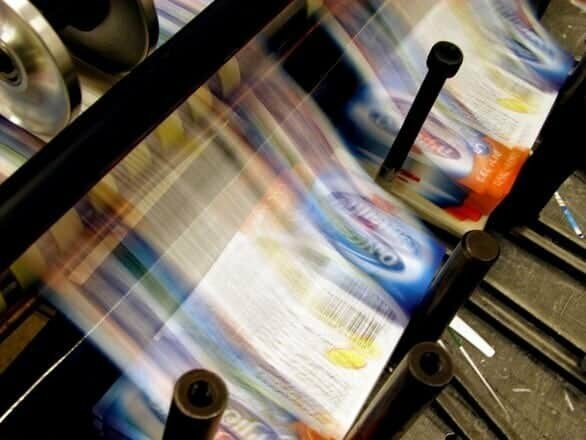 Variable printing has been around for a while but its potential when combined with highly targeted market research data is huge. As well as personalised text, variable printing allows you to alter graphics and images to really personalise your printed marketing materials. The degree of personalisation that can be applied by harvesting data on your customers online is unparalleled. So if you know that 5% of your email subscribers or Facebook followers love one particular product area then you can target a particular promotion through direct mail to just those customers, significantly increasing ROI. To digital marketers, it can often feel as if print is an irrelevance and that the hearts and minds of consumers must be won online. Of course this couldn’t be further from the truth and with so much focus on the rapidly shifting online environment and the next big thing it’s easy to forget the power print can play in a diverse multi-platform marketing campaign. Chris Holloway is Managing Director of Manor Printing and has a wealth of experience in print and design, having seen the industry change beyond all recognition in twenty seven years since joining the company.